It is really unfortunate that arthritic changes at knee joints are irreversible and cause a lot of pain and discomfort. While painkillers are the most effective way to get significant pain relief, one must try to avoid extensive drug use. Here are five most relevant ways to reduce the debilitating pain and get back to life. Resting is the best remedy is a myth in the case of knee pain. Rather, the patient must consult a qualified physiotherapist and start exercising. Studies show that aerobic exercises are the most suited for relieving arthritis progression and thus the symptomatic pain. Since knees are one of the important weight-bearing joints, it is necessary for an obese person to lose weight in order to reduce pressure on knee joints. Gradual weight loss will reduce the pain intensity. Hot packs must be applied while reclining and resting to avoid muscle stiffening, but the exposure to hotness must not be more than 15 minutes. Extended exposure can increase inflammation and can increase pain. Cold packs are more effective and also safer. Compressions also helps in reducing pain. However, the compression bandages must not be too tight to so that it affects the blood circulation. Massage with turpentine oil or eucalyptus oil acts as counter-irritants and thus reduces your sensation of pain. 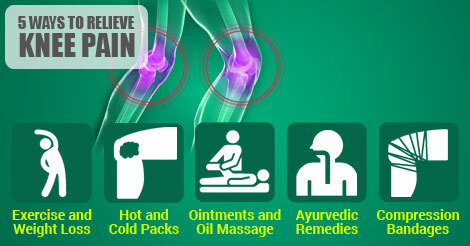 According to Ayurveda knee pain can be relieved by massaging knee with lukewarm coconut oil, drinking juice of bathua, and swallowing fenugreek (dry methi) seeds twice a day.